Canada Day in Vancouver, 2012: An RCMP officer raises his hand as a group of 60 people take the oath as new Canadian citizens. John Ibbitson is Writer at Large at The Globe and Mail. Darrell Bricker is Global CEO of Ipsos Public Affairs. They are the authors of Empty Planet: The Shock of Global Population Decline, from which this essay is adapted. The first thing the visitor heard as he approached the cab rank outside the airport was a lively discussion in Arabic, which brought him up short, because this was Inuvik. The makeup of the Arctic community on the Mackenzie Delta is roughly 40-per-cent Inuit, 40-per-cent First Nations and 20-per-cent everyone else – including about 40 Arabs, some of whom drive taxis. To the visitor’s ears, this was Canada’s most multicultural moment. It is also typical of this cosmopolitan land. Twenty-one per cent of Canada’s population was not born in Canada, and that percentage climbs every year. The Liberal government is targeting an annual immigration intake of 350,000, almost 1 per cent of the country’s population, by 2021. By 2060, this country should contain 50 million people. In a century when most developed countries will see their populations decline, Canada will continue to grow, robustly. In a world where many populations are aging, Canada’s ages more slowly, because the average age of immigrants is seven years younger than the general population. Yes, Canadians worry about the boomers growing old; yes, health care is perpetually under stress; yes, politicians argue furiously over whether to raise the retirement age, improve public pensions or both. But they argue less furiously than elsewhere. And Canadians have accepted levels of immigration, year after year, decade after decade, that would flummox people in most countries. Immigration, and the multicultural ethos it has produced, offers Canada a unique advantage in a world that is about to experience one of the great defining events of the 21st century. In about three decades, give or take, the human population will start to decline. If you find this news shocking, that’s not surprising. The United Nations Population Division projects that our numbers will swell to more than 11 billion by the end of this century, almost four billion more than are alive today. Where will we put them? How will we feed them all? How many more of us can this fragile Earth withstand? But a growing body of opinion believes the UN is wrong. We will not reach 11 billion by 2100. Instead, the human population will top out at somewhere between eight and nine billion, somewhere around the middle of the century, and then begin to decline. By 2100, we could be back to where we are right now, and steadily growing fewer. Wolfgang Lutz and his fellow demographers at Vienna’s International Institute for Applied System Analysis predict the human population will stabilize by mid-century, and then start to go down. A Deutsche Bank report has the planetary population peaking at 8.7 billion in 2055 and then declining to eight billion by century’s end. Populations are already in reverse in about two dozen states around the world. Some of the richest places on Earth are shedding people every year, thanks to low fertility rates: Japan, Korea, Spain, Italy, much of Eastern Europe. “We are a dying country,” Italy’s health minister, Beatrice Lorenzin, lamented in 2015. But the big news is that the largest developing countries are also about to grow smaller, as their own fertility rates come down. China’s rate is the same as Canada’s – well below the average of 2.1 children per woman needed for a society to sustain its numbers. Unlike Canada, China does not welcome immigrants, which is why, in a few years, the world’s most populous country will begin losing people. The birth rate of India, which will soon replace China as No. 1 in population, has fallen to 2.1 and will continue to go down. Brazil, which ranks fifth, has a birth rate almost as low as China’s. In a couple of decades, it, too, will start losing people. In many respects, this is wonderful news. The Earth will be healthier for having fewer of us on it. But there will also be challenges as we become a race of many old people, with not enough young people to support them. The solution to the challenge of an aging society is to bring in more young workers: the Canadian solution. The question is whether other countries are willing to embrace it. Why is population growth about to slow down and eventually reverse? In a single word: urbanization. In 2007, for the first time in human history, the majority of the planet’s population lived in cities. Today, it’s 55 per cent. A lot happens when people move from the countryside to the city. First, a child shifts from being an asset – another pair of shoulders to work in the fields – to a burden; just another mouth to feed. Even more important, a woman who moves to a city has greater access to media, to schools, to other women. She demands greater autonomy. And women who are able to exercise control over their bodies generally decide to have fewer children. Religious and familial pressures to settle down and make babies also recede in the city; friends and co-workers, who are largely indifferent to each other’s reproductive choices, become more important. Even in theocratic Iran, where almost half the population is urban, the fertility rate has dropped to 1.7. Africa remains the cradle of overpopulation, with birth rates far above replacement. If the human population truly is headed toward 11 billion people, as the UN predicts, then the African story in this century will be grim. The continent will remain largely poor and rural. Women will continue to bear child after child, swelling the numbers of humanity in the one place on Earth that can least sustain those numbers. But parts of Africa are making great strides in empowering women and reducing the number of children they have. In Kenya last year, almost as many girls as boys sat for the exams that graduate students from primary school. On average, the girls’ scores were higher than the boys’. Women make up 61 per cent of the members of Rwanda’s Parliament, the highest proportion of any government in the world. The fertility rate in that country has plummeted from eight to four in the past 30 years. Even in the African countries with the highest birth rates, those rates are starting to come down. Nigeria’s fertility rate is five. But it was almost seven in 1980. 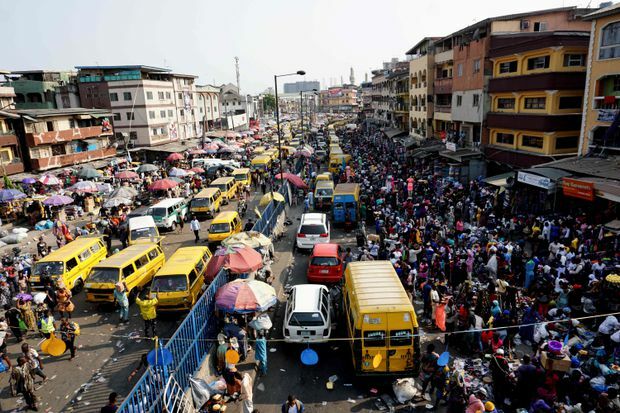 People and cars jostle for space on a road in Lagos, Nigeria, Africa's most populous city. There is much to celebrate about a future with fewer of us. Declining populations will ease the stress on land and water. Urbanization produces a marked decrease in carbon emissions per person – New York State has the lowest per-capita carbon emissions in the United States, thanks to New York City – and as people leave the countryside, marginal farmland reverts to bush, a natural carbon sink and a boon for wildlife. Economically, however, the future could be more challenging, as societies struggle to provide health care and pensions for older citizens with fewer young workers and taxpayers. Automation will help, but robots don’t buy refrigerators or a smart dress for the office party. Consumption powers every economy. Societies can reverse the effects of aging and shrinking populations by bringing in replacements. But many countries, such as Japan, simply refuse to accept immigrants. Japan lost almost 450,000 people last year. In other countries that have traditionally been more welcoming, an ugly surge of nativism threatens to close doors to newcomers. From the United States to Britain to Eastern Europe, populations that need to replenish themselves through newcomers are at risk of committing demographic suicide by keeping them out. But Canada has resisted, thus far, the tide of nativism infecting so many other developed countries, including some of the most socially progressive countries in the world. Two scenes from the winter of 2015: At left, migrants arriving in Malmo, Sweden, via Denmark are greeted by Swedish police at a train station. At right, a Syrian refugee family receives winter clothes and other items at Toronto's Pearson International Airport. The interview was not going well. A Swedish reporter doing research on Canadian immigration policy had called a Canadian journalist for background on the subject. But the two seemed to be at cross-purposes; the answers that came from Ottawa didn’t make sense to the interviewer in Stockholm. Eventually, they figured out the problem: They had totally different understandings of the meaning of the word immigrant. Sweden has a proud tradition of admitting refugees. Thousands of Danish Jews found refuge from the German extermination camps during the Second World War by fleeing to a welcoming and neutral Sweden. The breakup of Yugoslavia sent more than 100,000, mostly Bosnians, north to their new home. And when the collapse of civil order in Syria and Iraq sent people fleeing in search of safety, Sweden stepped up like no other country, taking in 160,000 asylum seekers in 2015, when the migration crisis was at its peak. For a country of only 9.5 million people, this was extraordinary. But the strain soon began to show. So many, so soon, from such a desperate part of the world. So many of them young men. How quickly could they learn Swedish? What jobs were there for them? Homelessness increased, as did unemployment and crime and resentment. Anti-immigrant sentiment fuelled the rise of the far-right Sweden Democrats, who took 18 per cent of the vote in last September’s election. So the Swedish reporter wanted to know how Canada was able to take in so many refugees, hundreds of thousands of them, year after year, with so little strife. Except that’s not what Canada does at all, the Canadian explained. Typically, about 10 per cent of the people who are granted permanent resident status (which puts them on the path to citizenship) each year are refugees; the rest are either immigrants brought in because they will contribute to the Canadian economy or family members of economic-class immigrants. The Swedish journalist was shocked. “Immigrants have always been accepted to Sweden for humanitarian reasons,” she observed. This is the fundamental difference between Sweden and Canada. Canada brings in immigrants for reasons that are entirely selfish, which is why immigration works better in Canada than in Sweden. Good public policy is always based on communal self-interest. Each of us is in it for ourselves. In most cases, “ourselves” includes our immediate family and, in diminishing importance, our neighbourhood; our village, town, or city; our region; our country; our planet. Of course we have empathy, of course we act for reasons of altruism. But you will only do something because it’s the right thing to do for so long, before you start asking yourself: “Why am I making this sacrifice? What’s in this for me or my family?” There are curbs on nakedly self-interested behaviour: Traditional codes of duty dictate that, in an emergency, women and children go first. But, in the main, effective public policy reflects collective self-interest: It’s good for everyone. This is particularly true of refugees and immigrants. Mostly German Jewish refugees embark on the St. Louis in 1939. They hoped to travel to Canada, but authorities there forced the ship to turn back to Europe. Historically, Canada had a rather shameful record of accepting people in distress. When the steamship Komagata Maru arrived in Vancouver in 1914 filled with citizens of the British Raj in search of a new home, the Canadian government turned them away. Far worse, when the St. Louis, a steamship filled with almost one thousand Jewish refugees, arrived in Halifax harbour in 1939, the ship was ordered to return to sea. A Canadian immigration official who was asked how many Jews Canada should let in replied: “None is too many.” Eventually, the St. Louis returned to Europe, where many of its passengers ultimately met their deaths at the hands of the Nazis. Prime Minister Justin Trudeau apologized for both misdeeds in the House of Commons. The infamy of the St. Louis was much on Ron Atkey’s mind when the immigration minister met his Progressive Conservative cabinet colleagues in July, 1979. The United Nations had issued an urgent appeal: Hundreds of thousands of Vietnamese had fled their country by boat in the wake of South Vietnam’s takeover by the Communists from North Vietnam. Those who hadn’t drowned or been killed by robbers were huddled in refugee camps in miserable conditions. A poll showed that most Canadians didn’t want them. Should the government listen to the poll? As cabinet members arrived, each found a copy of None Is Too Many, Irving Abella and Harold Troper’s landmark study of the St. Louis tragedy, on the desk in front of them. “Do we want to be known as the government that said no?” Mr. Atkey demanded of his Conservative colleagues, “or as the government that saved the day?” Cabinet voted to save the day. But it imposed a condition: Canada would accept up to 50,000 Vietnamese refugees, but it asked citizens and community organizations to privately sponsor them. The country responded magnificently, as church groups, service clubs, and families or groups of families banded together to bring in each new arrival. In the end, 60,000 Vietnamese boat people came to Canada, earning the country the Nansen Refugee Award from a grateful United Nations. Hong Kong, 1979: Vietnamese refugees wait at dockside at a transit camp for refugees. Canada would accept up to 60,000 Vietnamese people during the 1978-79 refugee crisis. Canadians learned several valuable lessons from the experience. First, refugees make great immigrants. The Vietnamese quickly integrated into society; people joked that every corner store seemed to be owned by a Vietnamese husband and wife. Two decades later, it seemed as though every top-of-the-class student in the country’s universities was the son or daughter of those corner-store owners. Second, private sponsorship was an excellent way to integrate refugees, who were dispersed across the country and who were well supported by the local community, preventing ghettoization. Private sponsorship became a permanent facet of Canada’s refugee program, especially during times of crisis. About half of the 50,000 Syrian refugees who came to Canada in 2015 and 2016 were privately sponsored. There were far more volunteers ready and willing to sponsor refugees than there were properly vetted candidates. Canadians embrace refugees and immigrants, not because Canadians are particularly nice, but because they have learned it is in Canada’s own interest to welcome them. That discovery is part of Canada’s historical DNA. But before we burst into song, let’s admit some uncomfortable truths: Not everything about Canada’s attitude to immigrants is as halcyon as it seems. Champlain, N.Y., 2017: A family from Haiti haul their luggage down Roxham Road into Saint-Bernard-de-Lacolle, Que. Hundreds of people would cross the Canada-U.S. border in Quebec and Manitoba that year amid fears of U.S. President Donald Trump's immigration policies. Donald Trump’s inauguration as President in January, 2017, spurred fears of deportation among foreigners living in the United States. Hundreds of them, mostly Somalis, trekked through the ice and snow from Minneapolis to the Manitoba border seeking asylum in Canada. 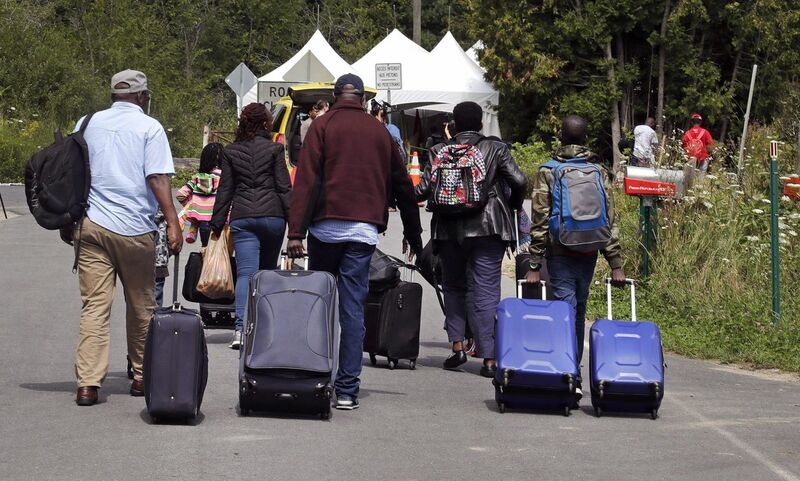 When summer arrived, thousands of others, mostly Haitians, crossed into Quebec – almost six thousand in August alone. In 2018, most of those making the journey across the border had flown to the United States from Nigeria and then headed north. Polls showed that Canadians were not happy with these claimants. One revealed that two-thirds of Canadians did not consider the asylum seekers legitimate refugees. The chaos at the border – at one point, the army had to be called in to provide temporary accommodation – undermined confidence in Canada’s immigration system. An open-door immigration policy is a particularly hard sell to Quebeckers, who are dedicated to preserving their national identity. Because the ability to speak French advantages immigrants coming into Quebec, the province has a different mix of newcomers than in the rest of Canada. While the top three source countries for Canada these days are the Philippines, India and China, the patterns of colonialism dictate that many Quebec immigrants come from French West Africa. Many of these immigrants are Muslim. They also tend to be less well educated than immigrants coming into the rest of Canada. So there are tensions, both economic and social. It probably is no coincidence that Quebec takes in a smaller share of immigrants than its population warrants. And the new Coalition Avenir Québec government of François Legault wants to reduce the intake even further. Quebec, in other words, grapples with the challenges of preserving its national identity while also bringing in sufficient numbers of immigrants to offset its low fertility rate, even as the rest of Canada absorbs wave after wave of new arrivals with relatively little social upheaval. But even in the rest of Canada, a significant minority of the population is uncomfortable with those newcomers and the efforts to accommodate them within a multicultural context. Canadian politicians of all stripes must protect and preserve tolerance and diversity within the Canadian mosaic. Multicultural openness is a far more successful and resilient structure than closed-door nationalism, of whatever variety. 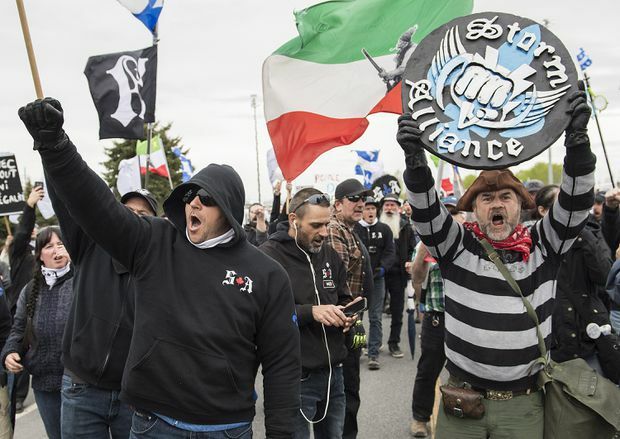 Saint-Bernard-de-Lacolle, Que., 2018: Members of the far-right group Storm Alliance march in an anti-immigration protest. 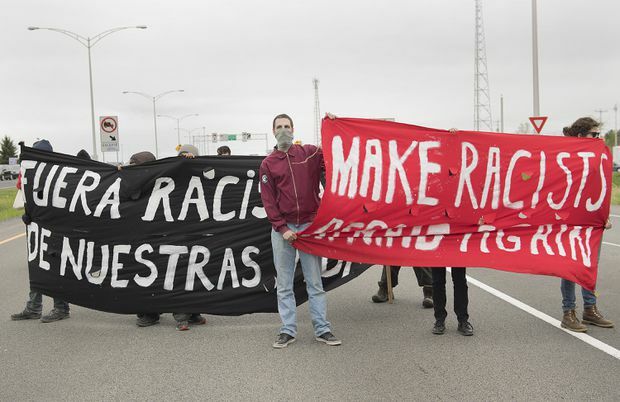 Counter-demonstrators, pictured below, blocked the highway next to the Canada-U.S. border. Some who fear that unchecked immigration could lead to a loss of cultural cohesion argue for government policies that encourage couples to have more children. Improving child-care services, extending parental leave – while encouraging the father to do his part – and offering financial aid for families with young children are all worthwhile. But such programs are very expensive, and nowhere have they brought the birth rate of a low-fertility society back up to the replacement rate of 2.1. A core reason for this is what’s known as the low-fertility trap. If a society experiences a generation or more of low fertility, goes this theory, then that condition becomes the new normal, a normal that’s almost impossible to change. As Sarah Harper of Oxford University describes it, “Employment patterns change, child care and schools are reduced, and there is a shift from a family/child-oriented society to an individualistic society, with children part of individual fulfillment and well-being.” Having a child is no longer an obligation to family and clan, to society, to God. It is a way for that couple to express themselves and to experience life. A new daughter will be far more important than the mid-century modern look they went for in the living room, or those two weeks they spent in the Costa Rican jungle, or that amazing – if rather insecure and underpaid – new job in graphic design. But she will be part of that continuum. Does this sound like anyone you know? Maybe people will change. Divorce rates are down in part because children felt the pain of divorce in their family, or in the families of their friends, and resolved to avoid it. Perhaps a generation of people who grew up with one or no siblings will want their children to experience the messy joys of a home with lots of kids. Maybe women will finally achieve the full equality they deserve. Maybe a third child won’t set back her career – at least no more than it sets back his career – because he throws himself into parenting every bit as much as she does. We are still a long way from this. But every year the gap narrows a little bit. In the meantime, we will grow fewer. A child born this decade will reach middle age in a world where population growth has stalled, and may already have begun to shrink. What will that world look like? We believe there will be much about it to admire. It will be cleaner, safer, quieter. The oceans will start to heal and the atmosphere cool – or at least stop heating. People may not be growing wealthier, but that might not matter so much. Power centres will shift – and centres of innovation and creativity, too. But it may be a poet who notices that, for the first time in the history of the race, humanity feels old. Not all the world will be aging in the same way. Africa will still be young, even at the end of this century. The continent will be dominated by supercities – chaotic, no doubt, and badly planned, but also vital and vibrant and bursting with new ideas. We have a hunch that the really exciting music and theatre, the truly ground-breaking innovations, the revolutionary new thinking in the last decades of this century will more likely come from Lagos or Mumbai than from Paris or Tokyo. Population decline is not a good thing or a bad thing. But it is a big thing. We have mostly ignored this approaching reality for too long; we must ignore it no longer. Canadians, at least, can greet that future with confidence, so long as we remain the most welcoming place on Earth. A Canada Day citizenship ceremony at Toronto's Harbourfront Centre in 2013.